Little kids and not so little kids look forward to indoor crafts when the weather is cold and snowy! I know I do! Everyone loves penguins - it's just something about them - could it be their waddle, or little faces or their black and white coloring? I just know they are so cute and fun to watch! This adorable penguin craft is made using items you can find at the dollar store or around your home, like socks, scarf, felt and bottles! And it's a cute and easy craft for both adults and children alike - perfect for those cold snowy days and any in-between time during the winter months! Save as, or copy the penguin template . . .
and cut out in felt. 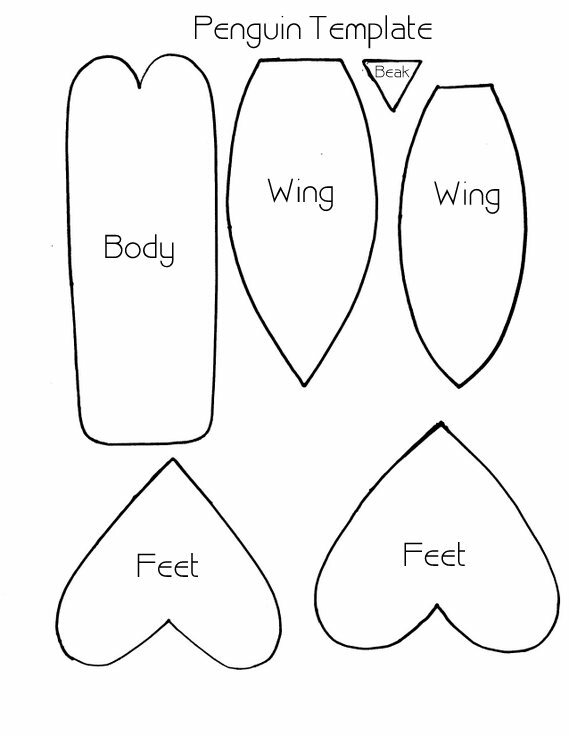 Glue on the smaller like pieces on top of the larger ones for the feet and wings. Next, pull the sock over the bottle . . .
and twist the sock* top around and down over the bottle. *This way you're saving the socks in case you want to wear them later. Lol! Glue on the body and then . . .
For the hat, cut out a 7 1/2" square from the fleece scarf. Run a bead of glue along one side . . .
and fold over creating a tube. Turn the tube inside out, cuffing one end and gathering opposite end, just below edge and tying. Try on hat over the sock bottle and adjust to fit down, just before tip of body. Glue on eyes, beak and wings. To finish, cut a narrow strip of fleece and tie around penguin, just below beak and over top of wings. Have fun making a companion or more! These little fellows are so adorable, just perfect for Winter decor! What a fun little project! Thanks, Chloe! They were truly fun to make! Oh my goodness, Gail! These are so cute! And I guessed wrong for the body...I thought it was a plastic bottle. Guess you could still use that and weight it with pebbles. Love ❤️! Thanks, Cecilia! That's a great idea to use water bottles and weigh them down with sand. I can see them bobbling all over the place! Gail, those are so darn cute. Love the little faces and bodies. Years ago, I made Mr. and Mrs. Santa Claus with large pop bottles. I'm such a sucker for penguins! These are adorable. Oooh these are so pretty!! I was an excited as a child when I saw penguins live during our recent holiday to Singapore...the penguins were in the zoo but ooh they were soo adorable !! Very very cute. Dropping over from Crafty Moms Share. What a cute idea for a winter craft! So very cute and a fun winter craft project. Hi Gail, I love these beautiful penguins! Your penguins are so adorable. Thanks for sharing them at C&C with J&J! Enjoy the week. Hi Gail. I just love your little craft! Featuring at Snickerdoodle Create Bake Make Link Party today!